We are just sixteen years into the 21st century and already we have seen some huge yet subtle cultural shifts. Some motion pictures that have been made in the past decade and a half could not be made today. I am not talking about movies that cannot be done because a great actor or director died, I am talking about movies that may have been relevant in recent history but could not be made today because of either technology or societal changes. Things are changing rapidly especially in the tech world and if your movie plot is based around technology, it probably will not age as well as it should. Plus, in our overly PC times there are things movies could get away with in previous decades that simply would not fly today. These ten movies that were made not so long ago, now feel very dated and archaic. If this movie was made 20 years earlier it probably would have been one of the biggest hits of 1993. Instead it feels like a movie from another time. It actually felt like a feature film of the second act to the 1997 John Travolta/Nicolas Cage quintessential 90s actioner Face/Off where Cage’s character is sent to a futuristic prison. By the time 2013 rolled around this felt like they were making a script that sat on the shelf for decades. Plus the teaming of Stallone and Schwarzenegger as the two leads (not part of an Expendables ensemble cast) did not have the draw on audiences that it would have in the 80s or 90s. 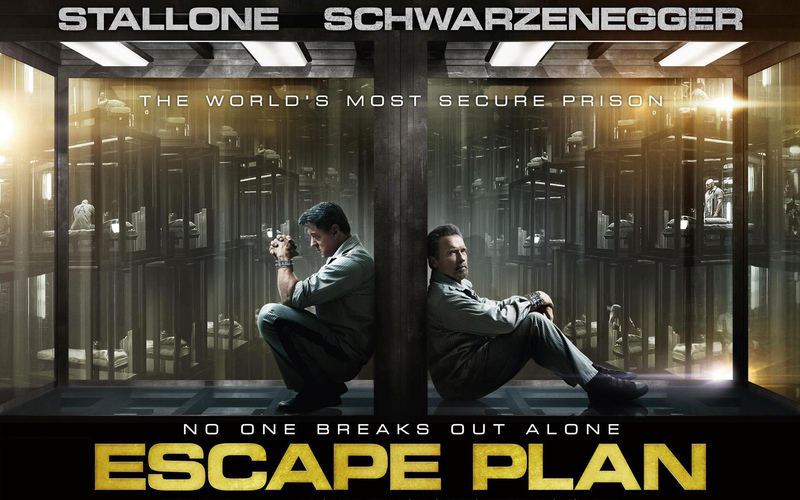 Escape Plan flopped, nobody really cared and we will probably never see these two action heavy weights share top billing in a major motion picture ever again. That being said, Escape Plan is a fun little time killer with decent action and good performances from its actors. In the years leading up to 2012, when the Mayan calendar ends and supposedly predicts the end of the world, medium scaled hysteria started to plague those easily scared. Of course Hollywood wanted to capitalize on that and who better to do so than Roland Emmerich, the director who specializes in destroying major landmarks with films such as Independence Day (1996) and The Day After Tomorrow (2004). 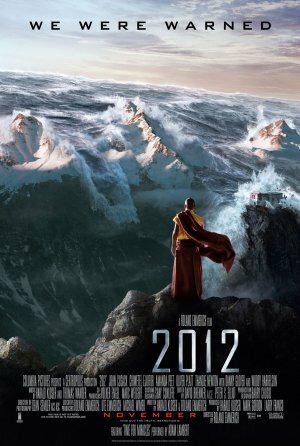 Similar to the Y2K pandemonium that swept through the world in the late 90s, 2012 was a year just like any other. No mass amount of death or destruction. 2012 capitlized on the fear and hype of the supposed apocalypse but since we are all still here and know that it was just man made hysteria, 2012 cannot be made today. I am sure there will be another rumor in the near future about when the world is supposedly going to end and Hollywood will take advantage of the opportunity and make a big spectacle of that. 2012 is a nice time capsule. It is a fun special effects extravaganza. 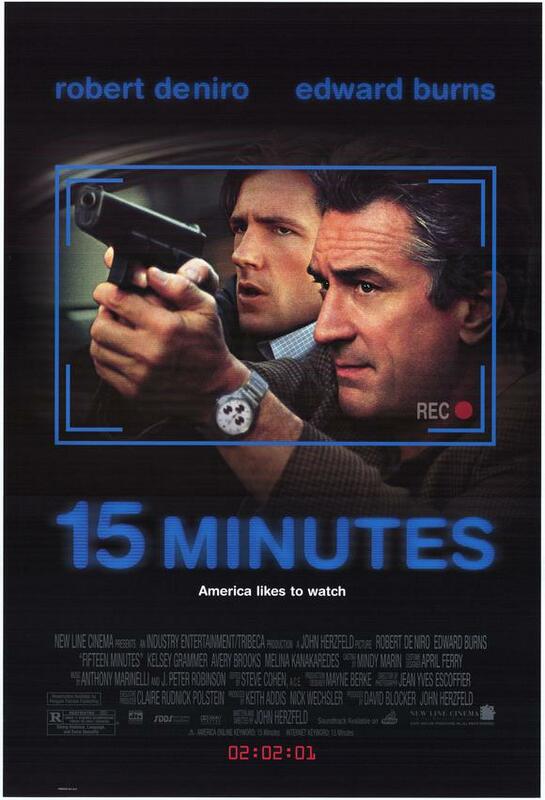 This movie could never be made in 2016 not just because Ed Burns’ star power is practically non-existent, just look at the size of the video cameras the two killers go around and use in 15 Minutes. This movie could not be made today because of the fast evolution of home recording. Today everyone already records their lives and streams it on the internet for everyone to see, not just two foreigners. The behavior these criminals displayed seemed unique and groundbreaking in 2001 but today with Twitter, Youtube, Instagram, this is what almost every high school student is doing, minus the crime spree. I liked the movie as an updated Natural Born Killers-esque social commentary, but it does not hold up and works only at a time when technology was not nearly as invasive in our lives as it is today. There are a lot of reasons this movie could never be made in 2016 but I for one am especially glad that I was able to experience this in the theaters because I likely never will see anything like this again. First of all at the time that it was made Rodriguez and Tarantino were practically peers as filmmakers. Since then, Tarantino’s stock has only risen with Oscar winning pictures such as Inglorious Basterds (2009) and Django Unchained (2012). Whereas Robert Rodriguez has fallen as a once great visionary director with some uninspired children’s movies and a Sin City sequel that bombed at the box office. It is unlikely that Tarantino would be part of a project such as this in the future, but since he is one of our most unpredictable filmmakers, you never know. 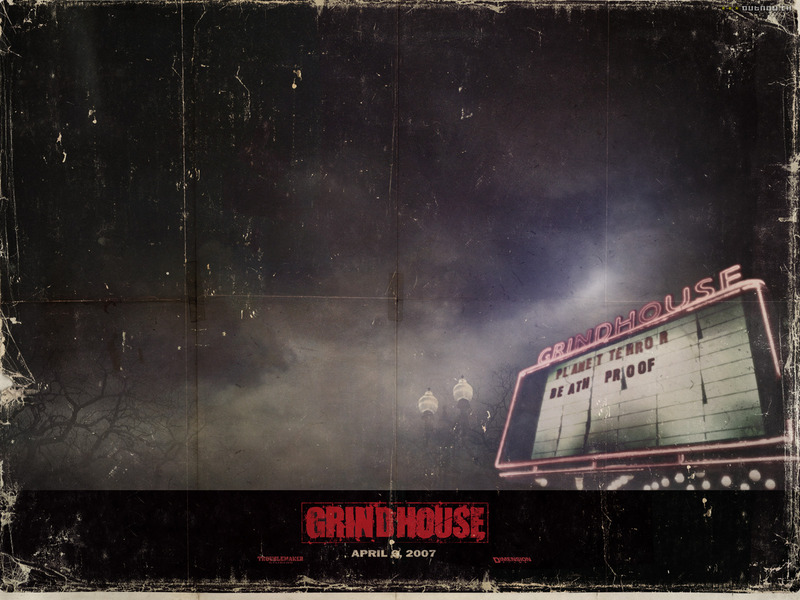 The second thing, Grindhouse was a cinematic experience with two movies for the price of one. These two directors were trying to bring back the grind house double feature feel of exploitation movies that ran in old movie houses to the big corporate multiplexes. The problem was, many people in the audience did not realize this and left at the end of the Robert Rodriguez movie Planet Terror and missed Tarantino’s Death Proof and the super fun fake trailers in between the two features. Whether it was not advertised properly or people just did not want to sit for another 90 minutes, the experience was not meant for audiences in 2007. It did inspire the Danny Trejo star vehicle Machete (2010) and its sequel from a fake trailer at the beginning of Grindhouse but that is very different experience. Plus, the violence and the grainy look and feel of the film stock might not be something that a studio would approve of today. Grindhouse was a noble and fun experiment that worked for some but was not profitable enough to ever be duplicated. A good sophomore film from the creators of Borat (2006), although not as funny as Sacha Baron Cohen’s first star vehicle, but far more offensive with its homosexual stereotypes. There is no way that some of these jokes in this movie would fly today. Our society has become far too PC and would never accept the outrageously offensive gay behavior from the title character. Adam Sandler has made some borderline offensive jokes in his films that debase homosexuals, but nothing as egregious as what we see in this movie. I highly doubt a movie with this many obscene negative homosexual stereotypes would ever get made today. This effective and moderately influential horror movie that boosted the careers of its director Gore Verbinski and star Naomi Watts and inspired other Americanized remakes of Japanese horror films could never be made today because of three letters, V-H-S. The entire plot revolves around a video tape and if you watch it you will die. 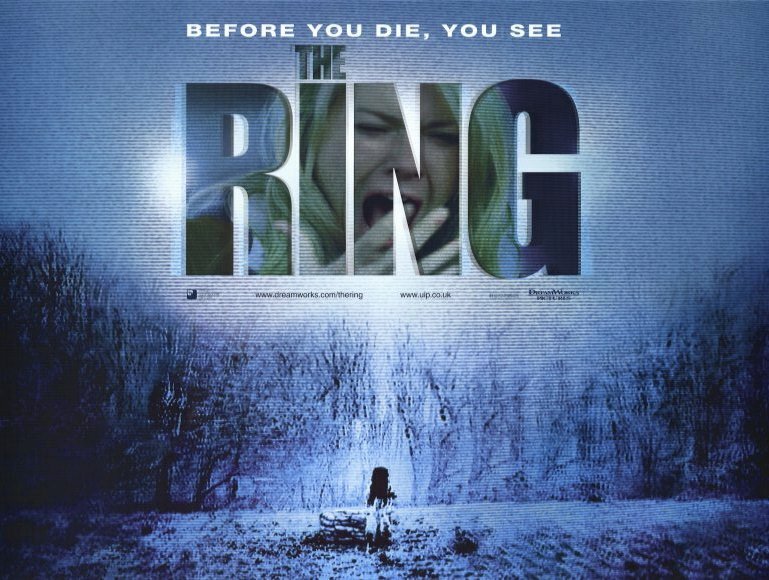 Sure they could turn the video tape into a website or a streaming video and they have tried to duplicate the success of The Ring by using the plot through other mediums and it has not really worked. The device that propels the story could never be used today making this movie one of the last pictures from the days when VHS was the primary form of home movie watching before DVD and eventually streaming would take over. This is another movie that relies heavily on the now dead VHS technology and feels even more out of place that everything else on this list. 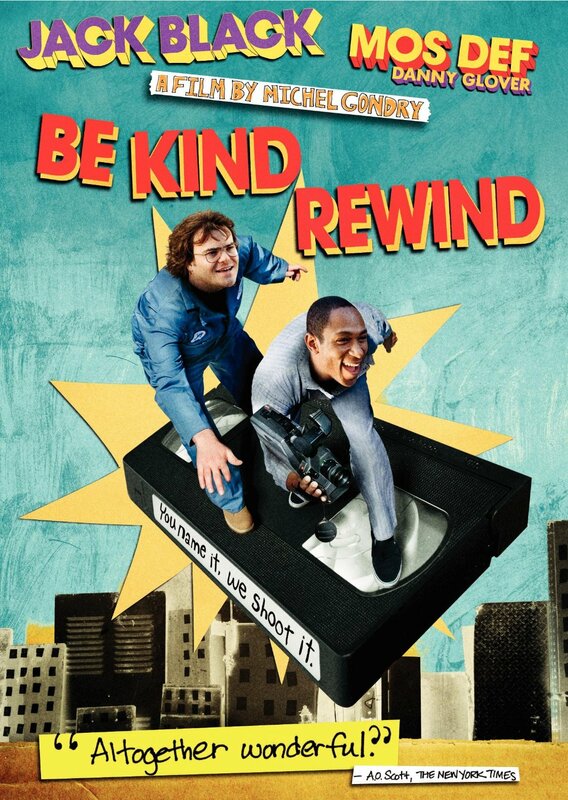 It is very hard to believe that Be Kind Rewind was released in 2008 when you consider that motion picture studios stopped releasing movies on videotape in 2006. It acts as a love letter about how movies can bring people of different ages and cultures together and there is something lost about going to the video store and looking at all the rows of video tapes and the art work on the boxes that cover them. But even still when they are trying to find a copy of Ghostbusters (1984) they could not and I remember going to eBay and seeing VHS copies of that movie for less than a dollar. I am very surprised this was made when it was because even in 2008 this seemed like a movie that should have been made closer to 1998. Another movie where the title really tells you exactly why this would not be conceived in 2016. 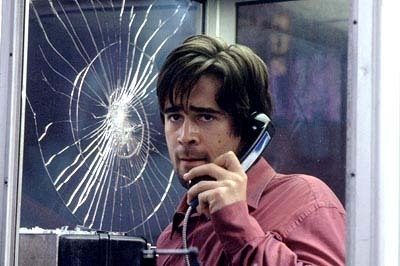 Originally set for release in 2002 but pushed back because of the Beltway Sniper killings outside of DC, Phone Booth would eventually get a wide release in April 2003. It is an effective and well acted real time thriller but seems like it should have been made about ten years earlier. Even in the early 2000s when it was made, cell phones were very common and starting to replace the need for pay phones. Regardless of cell phones, when was the last time besides a Superman movie that you saw an actual phone booth and not a row of pay phones or single pay phone just out in the open? The film acknowledges this with a few lines in the script but still, it feels very odd and out of place. What a difference a few years can make. Maybe if Phone Booth was released in the late 90s it would not have felt as strange since not as many people had cell phones, but by 2003 it was like a last gasp for the MCI, Bell Atlantic and 1-800 COLLECT era of communication before AT&T would compete with Verizon and Sprint for everyones cell phone bill. A good concept with a great performance from an early Colin Farrell at a taut 81 minutes, it is still worth checking out. One of the best performances of Robin Williams’ career could not be made today and not just because of his untimely death. Once again technology prevails and has moved faster than this film could have anticipated. It seems like a century ago when people had to rely on film developers to get their pictures taken. 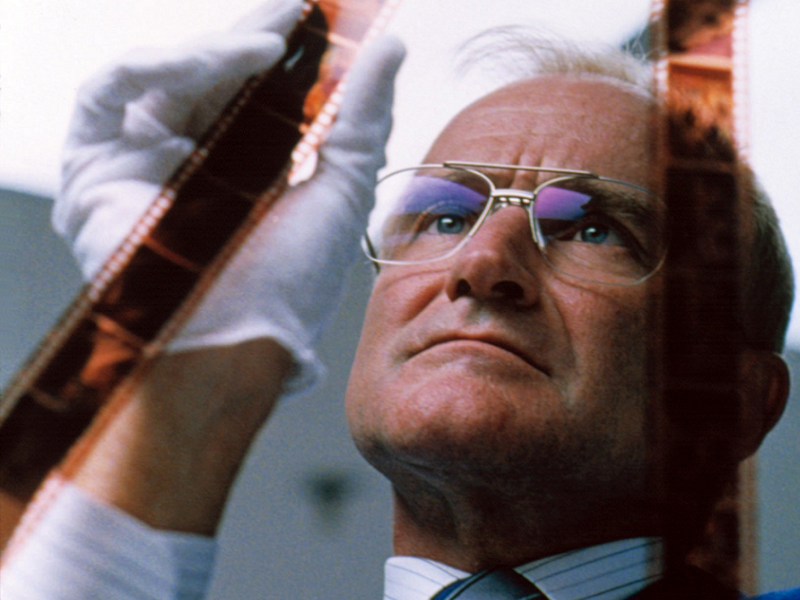 When One Hour Photo was made, that was exactly how life was. No Instagram, no cameras on phones and still very few digital cameras available to the public and they were very expensive. Dropping off your camera or roll of film at a CVS or Walmart was how people got their pictures. They made a modern Hitchcockian thriller about this mundane chore and it was immensely powerful and unnerving. One Hour Photo still holds up as a great thriller with a phenomenal performance from its lead, but it would never be made today for obvious reasons. One of the best movies of the new century from the best director to emerge this millenium could never be made today. Not because of its backwards narrative structure or its brilliant editing that confused many viewers, but once again because the plot is driven by a defunct technology, Polaroid pictures. Sure they could try and give the main character a digital camera or make notes taking pictures and using his Smartphone, but it would not have the same feeling as the instant film effect of the Polaroids. Nine years later Christopher Nolan would take the ideas and themes he used in his independent film Memento to the next level with the big budget Inception successfully transferring his vision for the digital age with some of the best digital effects of its time. 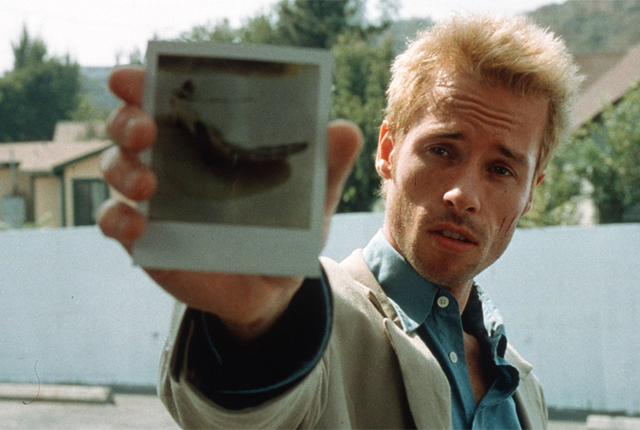 Both are terrific works of art but Memento and its stark minimalist style triumphs as a film of its time that will last as a modern noir classic for all time.